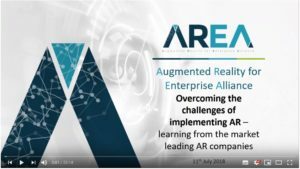 Fractured, underfunded, unknown, immature, reactive and uncertain are some keywords often associated with describing the current state of AR in the enterprise. 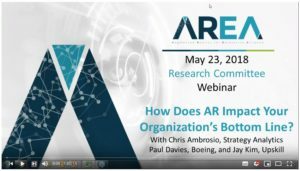 Take a look at this Webinar which discusses ‘Overcoming Barriers to AR Adoption – A Security Perspective’ with Brainwave CEO, Tony Hodgson, Stan Hanks from Realwear, Ben Cale from Welsh Water, Vladimir Beliavski from Bosch and Bob Labelle, also from Brainwave. Previous AREA Webinars are also available to view. Select from the list below, all hosted on our AREA YouTube channel. 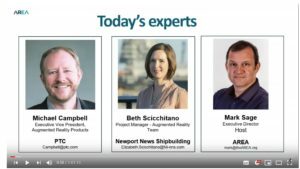 In this webinar, you will hear from Michael Campbell, EVP of Augmented Reality Products at PTC and Beth Scicchitano the AR lead at Newport News Shipbuilding. They will be providing insights, experience and challenges of implementing enterprise AR. As the AR ecosystem grows, there are implementation challenges that enterprises need to overcome. This is the focus of this AREA webinar held 12 July 2018 with Theorem Solutions, Augmate and Atheer. How Does AR Impact your Organization’s Bottom Line? The primary reason for – and the ultimate test of – any AR solution is its return on investment (ROI). Yet when large organizations attempt to conduct ROI analyses on emerging technologies like Augmented Reality, they often encounter obstacles and unknown variables. Take a look at this webinar from Strategy Analytics and Upskill. Augmented Reality and Internet of Things (IoT) are technologies that are often grouped together by business. Yet many leaders and managers are unclear HOW, or indeed IF, these technologies are complimentary or contradictory. 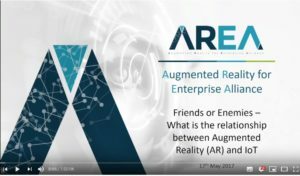 This webinar looks to clarify these technologies and investigate if IoT and AR are Friends or Enemies. For a full list of all our AREA webinars visit our YouTube channel.